After several preliminary demonstrations Adobe released today an SDK (software package for Developers) which consists of 3 applications for iPad. Eazel, Nav and Lava are new tools that should allow future users of iPad to enhance their Photoshop experience by tapping into the multitouch display of the iPad. Eazel – Adobe Eazel lets you use your iPad and your fingertips to paint beautiful works of art. You can paint across your entire iPad screen, and easily access all the tools you need. Eazel also lets you send your artwork directly to Photoshop CS5 from any location—all you need is a network connection between your iPad and computer. Alternatively you can do all your painting in the app, and share via email. Here is more info and a demo. Nav – With Adobe Nav and a network connection between your iPad and computer, you can customize the Photoshop CS5 toolbar on iPad to easily access the tools you use most. You can browse, reorder, view, and zoom in on up to 200 open Photoshop documents on iPad. Tap a document on iPad to make it the active document in Photoshop CS5. Here is more info and a demo. Lava – With Adobe Color Lava, you can use your fingertips to mix colors on your iPad and create custom swatches and five-swatch themes. Instantly access them in Photoshop CS5—all you need is a network connection between your iPad and computer. 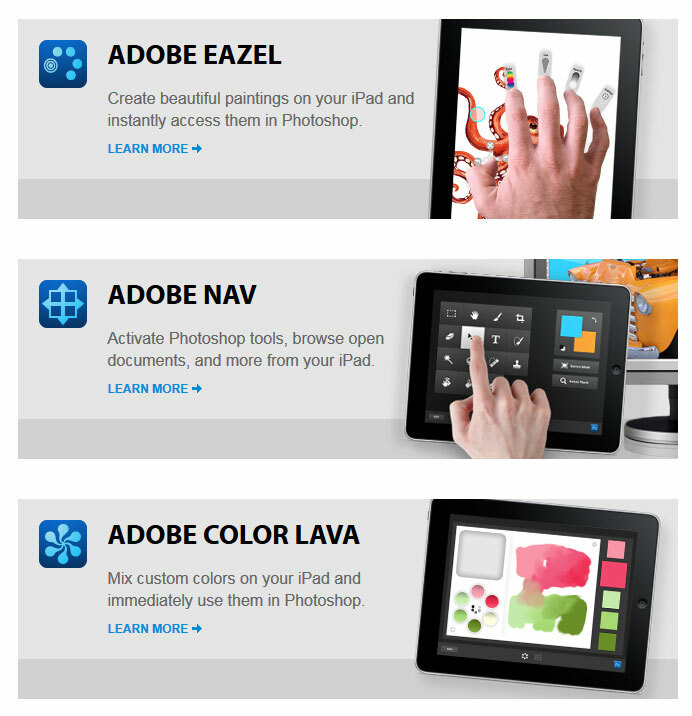 Or use the app and then bring your colors into Photoshop CS5 when you’re connected you can even share colors via email. More info and a demo. 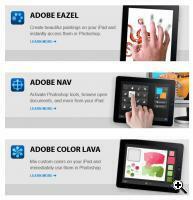 All 3 apps, which aren’t yet available, use Adobe’s Photoshop Touch SDK. This software development kit lets any developer write iPad apps that interact with Photoshop as well as other platforms such as Android Honeycomb and the future BlackBerry PlayBook OS. Bringing touch to Photoshop makes the 20+ year old software young again and full of innovative possibilities – it still remains to be seen how Adobe, and more importantly other developers, will choose to implement its enormous capabilities. TFOT covered several touch related technologies in the past, including the Optimus Upravlator, the Genius EasyPen and Toshiba’s Touch Multimedia Tablet.